"City remain the [1.7] favourites to defend their crown ahead of Liverpool at [4.0], Chelsea at [12.5] and Spurs at [19.0]. Watford meanwhile can be backed at around the [300.0] mark 'to do a Leicester'." Chelsea, Liverpool, and Watford maintained their 100% winning starts to the season with wins over Bournemouth, Leicester, and Tottenham respectively over the weekend. But despite all three clubs sitting on 12 points at the top of the table it's defending champions Manchester City - who got the better of Newcastle at the Etihad Stadium - who still trade as favourites to win the title. Liverpool weren't at their best in Saturday's early kick-off but Jurgen Klopp's men got the better of Leicester at the King Power Stadium thanks to goals from Sadio Mane and Roberto Firmino. An error from £67m summer signing Allison give the Foxes a glimmer of hope but the Reds held on to make their best ever start to a Premier League season. Chelsea also had a far from easy afternoon against previously winless Bournemouth but second half goals from Pedro and Eden Hazard secured the points for Maurizio Sarri's men, meaning the Blues go into the international break with maximum points from their four games played. But undoubtedly the surprise package of the early season campaign is the success of Watford who made it four wins out of four when coming from behind to beat Tottenham 2-1 at Vicarage Road. 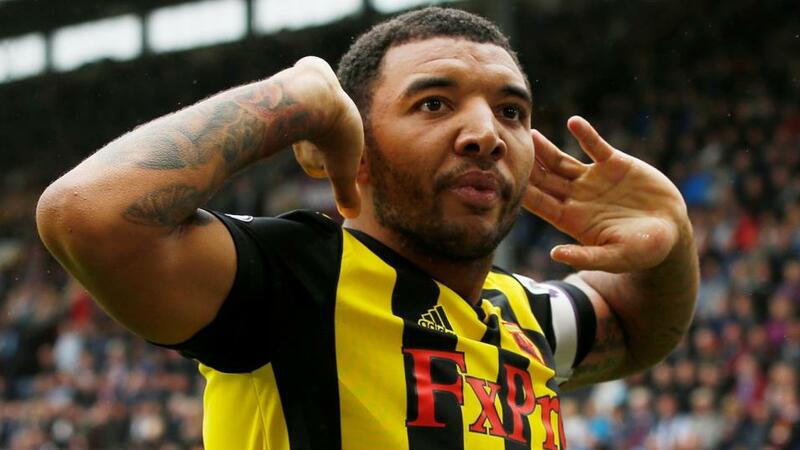 Abdoulaye Doucoure's unfortunate own goal had given Spurs an early second-half lead, and at this point the Hornets were matched at [45.0] in the Match Odds market but goals from Troy Deeney and a Craig Cathcart header continued Watford's dream start to the season. Manchester City were expected to roll over Newcastle on home soil but Pep Guardiola's men required a terrific Kyle Walker long-range strike to take all three points after DeAndre Yedlin had levelled Raheem Sterling's opener. City remain the [1.7] favourites to defend their crown ahead of Liverpool at [4.0], Chelsea at [12.5] and Spurs at [19.0]. Watford meanwhile can be backed at around the [300.0] mark 'to do a Leicester'. The pressure eased a little on Manchester United manger Jose Mourinho after his side won 2-0 in a dominant display over Burnley at Turf Moor. After defeats against Brighton and Tottenham, and following Mourinho's 'respect' walk-out of his post-match press conference, the United manager was widely regarded as a strong favourite to be the first manager to leave his post in the Premier League, but he got the response he had demanded with a brace of goals from Romelu Lukaku. Arsenal are level on points with United just above mid-table after they won a hard-fought game 3-2 at the Cardiff City Stadium. The Gunners can be backed at [3.5] in the Top 4 Finish market while United are slightly more fancied at [2.3]. After their 100% winning start to the season Watford are the big movers in the Top 6 Finish market, now being able to back at around [7.2] having been matched at [80.0]. Of the other clubs fancied to make the tough ascent into the top six newly-promoted Wolves almost halved in price on Saturday afternoon after they won 1-0 at West Ham on Saturday afternoon, though Everton eased in their market after they could managed just a 1-1 draw at home to struggling Huddersfield. Following their home defeat to Liverpool, Leicester can be backed at [8.4] to finish in the top six this term. There was cause for optimism amongst West Ham fans prior to the new season; following the recruitment of some big-name signings and the appointment of title-winning manager Manuel Pellegrini, the Hammers were strongly fancied to be one of the sides to challenge for a top six finish. But following their fourth consecutive league defeat - that has included home losses to Bournemouth and Wolves on Saturday - the Hammers are now trading as fourth favourites for the drop at [3.7] having been matched at a high of [13.0]. West Ham are the only club in the top four division of English football not to pick up a single point from their first four games of the season.